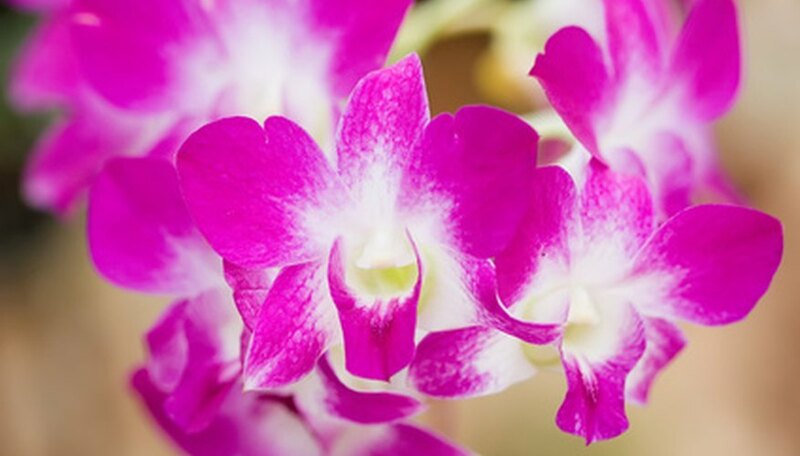 With more than 1200 species, dendrobium orchids bloom in an array of showy colors. Its rich green foliage varies between deciduous or evergreen, based on the species. Native to the continent of Asia, these hardy orchids have a rapid growth rate and are easily grown from seeds. These orchids are susceptible to several diseases, however, which can be injurious, if not fatal, to the dendrobium orchid if left untreated. Botrytis blight is a fungal disease that thrives in poorly ventilated, damp areas. Orchids are especially susceptible to botrytis blight in the winter and spring seasons. The fungal spores develop on dead and decaying debris and defoliation that lies around the orchid’s planting area. Transported by wind and rain, the spores germinate on stems and flowers of the orchid. Infected dendrobium orchids develop small brown spots which are often accompanied by pink margins. The orchids experience growth stunt, dieback and, at times, severe defoliation. Botrytis blight is easily controlled by maintaining good air circulation and by keeping the area free of debris. Orchids should also be watered at soil level in order to keep the flowers and foliage dry. Fungicidal sprays are effective in controlling further outbreaks. Fusarium wilt is a destructive disease of orchids. This soil-borne fungal disease kills causes infected dendrobium orchids to experience an array of symptoms that always result in the death of the plant. These symptoms include growth stunt, wilt, chlorosis and dieback. Fusarium wilt infects the orchid through its root system which causes the decay and failure of the plant’s vascular system. This vascular damage prevents the orchid from transporting water and nutrients throughout the system. There is no cure for fusarium wilt. Infected dendrobium orchids should be removed and destroyed to prevent cross infection. The orchid virus is a general term for more than 30 different viruses that affect orchids. Infected orchids may or may not experience visual symptoms but all infected orchids will experience reduced vigor, if not growth stunt. Some infected orchids develop ring spots and lesions which develop into necrotic areas. Leaf curling and unevenly colored blooms are also a sign of orchid viral infections. Enzyme testing is the only definitive way to determine if the dendrobium orchid is infected with a virus. There is no cure or treatment for orchid viral infections.